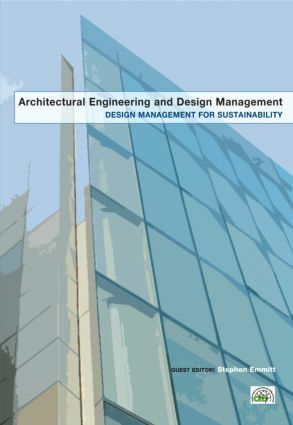 Building on the special edition Aspects of Design Management (Volume 3:1, 2007), this publication brings together the rapidly developing field of design management with that of environmental sustainability. Eight articles drawn from around the world help to provide some critical insights into the relationship between ecological sustainability and the application of design management in a number of different contexts. Contributions range from early policy decisions and public procurement options; to corporate social responsibility of architects and the promotion of materials and products to specifiers; to encouraging change and a design process evaluation method; to investigations into the role and contribution of construction design managers and facilities managers to a sustainable built environment. Collectively the articles provide a unique, multi-disciplinary, contribution to the theoretical development of the design management field as well as guidance on the practical application of methods and tools.